Describe how a VRF HVAC system enabled the Studio Gang Chicago office to reduce energy use, improve occupant comfort, and satisfy criteria to successfully transform the 1937 structure into a City of Chicago Landmark building. Explain how passive technologies, such as stone wool insulation, were used by The House at Cornell Tech to earn the rigorous Passive House certification, significantly reducing the need to spend energy heating and cooling a building. Explore the multi-faceted nature of sustainable design and the need for LED lighting fixtures that are highly efficient, manufactured in an environmentally responsible manner, and capable of creating a comfortable, high-quality visual environment. Give specific examples of how certain attributes and performance qualities of glass contribute toward satisfying criteria in the LEED v3 and LEED v4 green building rating systems. Over the years, the scale of sustainable design has exploded, creating an exhaustive list of considerations that range from the sustainability of the selected project site to the energy use and efficiency of the building, the health and wellness supported by the interior, and even the life-cycle impact and recycled content of every product included in the structure. In the past, navigating the necessary compromise was one of the biggest challenges inherent in satisfying sustainable criteria. For example, providing occupants with access to views also required protection from the glare and solar heat gain that causes discomfort and increases the load on the HVAC system, or choosing between products that would enable the building to perform with incredible efficiency or products that were produced with low environmental impact. Design firm Studio Gang transformed the National Polish Alliance building, built in 1937, into its Chicago office and earned the building the City of Chicago Landmark status, while creating a 21,000-square-foot office interior that was comfortable and energy efficient. Today, the market is much better equipped to support the sustainable design effort. New products, research, and approaches to design enable projects to better satisfy the many different aspects of green building. 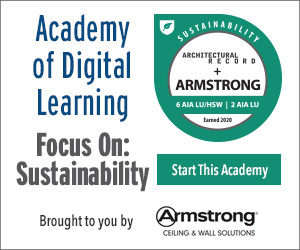 This course will take a closer look at four projects that satisfied impressive sustainability objectives and the technology and product solutions behind their successful designs. 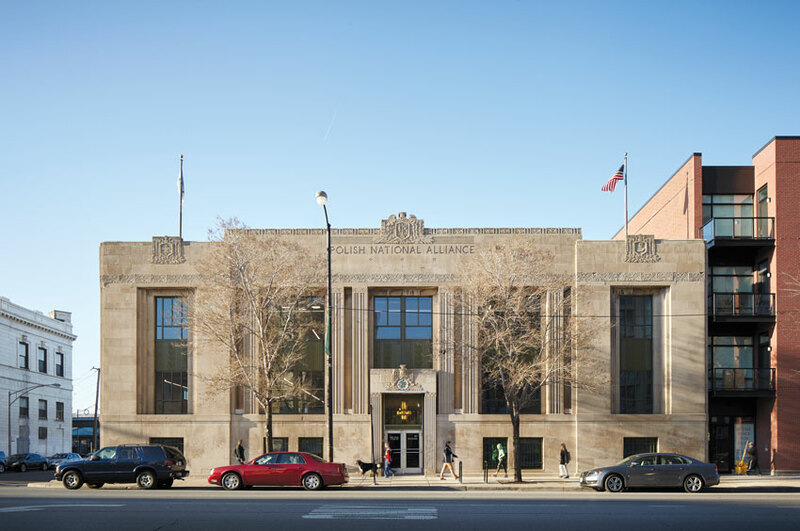 The Polish National Alliance building in Chicago, originally built in 1937, was recently transformed into the new Studio Gang Chicago office, the architecture and urban design practice founded and led by Jeanne Gang. The challenging renovation turned the existing structure into a 21,000-square-foot office space featuring a prairie roof and adjacent event space, and a City of Chicago Landmark building. The project had several unique sustainability-related design goals. When the studio gang team began thinking about HVAC, that Landmark status became important and required that building performance significantly exceed current ASHRAE standards, while the physical disruption to the original structure was to be minimal. Aesthetically, maintaining the appearance of the historic building without visible modern-day enhancements was critical. The building also needed to function as a contemporary, high-performance office space, event space, and rooftop prairie. People in the building needed to feel comfortable and productive. The rooftop needed to be aesthetically pleasing and suitable for guests. Careful consideration was given to the various building systems and technologies available to find solutions that would help the project achieve its many sustainability and performance-driven objectives. This was especially true in the case of selecting a suitable HVAC system. The design team needed to find a system that could help the building exceed the ASHRAE baseline performance by at least 17 percent, the mandatory performance criteria for attaining Landmark status. It was also important to keep employees and clients cozy in harsh Chicago weather without creating a historically inaccurate eyesore that would aesthetically disrupt the rooftop space. The HVAC answer for the Studio Gang Chicago office project was a variable refrigerant flow (VRF) HVAC system. “VRF satisfied the functional, cost, acoustic, and visual requirements. In terms of cost, it was pretty competitive with a conventional system, but where VRF stood out was that it met Landmark’s performance requirements of exceeding ASHRAE standards by at least 17 percent. No other system could meet that requirement,” Soenksen explains. “We’ve been very happy,” said Studio Gang Chief Financial Officer Meredith Mack. “The VRF HVAC system has been far less noisy than the old system and way more consistent and comfortable than our old office. People are way more comfortable, and it’s actually costing us less per square foot,” Mack explains. The previous office space had a monthly expenditure (electric + gas) of $0.14 per square foot. The new office space comes in at $0.11 per square foot. In a 21,000-square-foot office space, that generates a savings of more than $600 every month. With a low solar heat gain coefficient and neutral appearance, Guardian SunGuard® SNR 43 coated glass is designed to take advantage of the local climate to reduce cooling and heating needs while letting in abundant natural light. Mitsubishi Electric Cooling & Heating’s sleek new 2-by-2 PLFY Ceiling Cassette with square-edge design fits within the same space as many standard ceiling tiles. The redesigned 3-D i-see Sensor™ continuously scans the room, adjusting temperatures to maintain comfort without sacrificing efficiency. Available in capacities from 5,000 to 18,000 Btu/h. ROCKWOOL CAVITYROCK® products are semi-rigid stone wool insulation boards designed for exterior cavity wall and rainscreen applications. These sustainable products offer superior long-term thermal efficiency, fire resistance, moisture control, and acoustic performance, improving the energy efficiency and comfort of buildings. CAVITYROCK is compatible with numerous framing systems and cladding attachment systems. Pixels allows you to tailor architectural lighting solutions with flexible, modular, customizable 12-by-24-inch LED sheets. The easy-to-power, lightweight, ultra-thin 1⁄8-inch profile mounts to surfaces by tacking, stapling, or using 3M adhesive on back. Easily specifiable, scalable, and modifiable in the field, Pixels extends the boundaries of what can be illuminated, making it the future of fixture-free lighting.